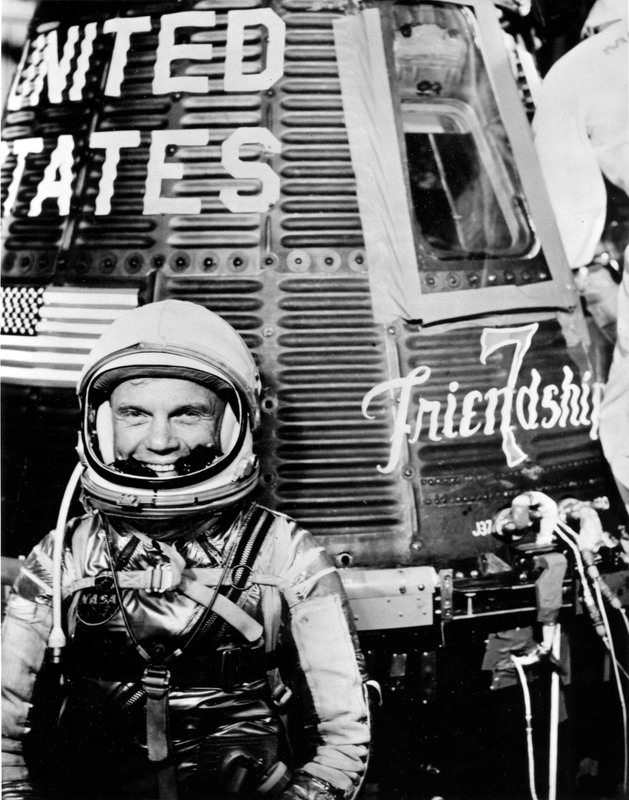 John Glenn was one of America’s most beloved and most recognized aviation heroes. 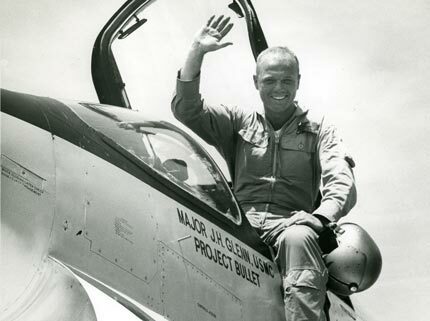 While he is best known as the first American to orbit the Earth, he began his career as a fighter pilot and test pilot, and had a passion for aviation all his life. Glenn was born in 1921 in Cambridge Ohio, the son of a plumber and a school teacher. After graduating high school in 1939, he attended Muskingum College. It was here, while studying engineering, that Glenn earned his pilot license, which he did for college credit in a physics course. Glenn left college before graduating, as the Japanese attack on Pearl Harbor prompted him to enlist in the U.S. Army Air Corps. The Air Corps never called him to duty, so in 1942, Glenn enlisted as a United States Navy aviation cadet and attended flight training. It was during his advanced pilot training that Glenn accepted transfer to the U.S. Marine Corps. In June 1944, Glenn was stationed in the Marshall Islands where he flew 59 combat missions. He survived five instances of anti-aircraft fire in which his aircraft was hit. For his success in the air, he was awarded ten Air Medals and two Distinguished Flying Crosses. Glenn would be posted at various locations during the war, and would not return home until December of 1948. He spent his years between World War II and the Korean War as a flight instructor in Texas and was then posted to the staff of the Commandant of Marine Corps schools. In July of 1952, Glenn was promoted to major. During the Korean War, Glenn flew an additional 63 combat missions, and was awarded the Distinguished Flying Cross twice more, as well as another eight Air Medals. Seeking to stay in the air after the Korean War, Glenn applied to be a test pilot, and graduated from training in 1954. His first assignment was flying the FJ-3 Fury, which almost killed him when the oxygen system failed. For three years, Glenn accrued nearly 9,000 hours of flying time on new and experimental aircraft. In 1958, NASA began recruiting pilots for its space program, and Glenn was eager to apply. He slipped in just under the age cutoff of 40, and his passion, enthusiasm, guts, and distinguished aviation career propelled him through the screening process and ultimately earned him his place as one of the Mercury 7. Glenn joined the program in 1959, and would make his famous flight around the earth in 1962. His flight made him the third American and fifth person to have ever gone to space. After the success of the space mission, Glenn retired from NASA at the age of 42. He began a new career in politics, and would hold a seat in the U.S. Senate from 1974 until 1999. While it seemed that his space days were over, Glenn would spend two years lobbying NASA in an attempt to get back above the sky. 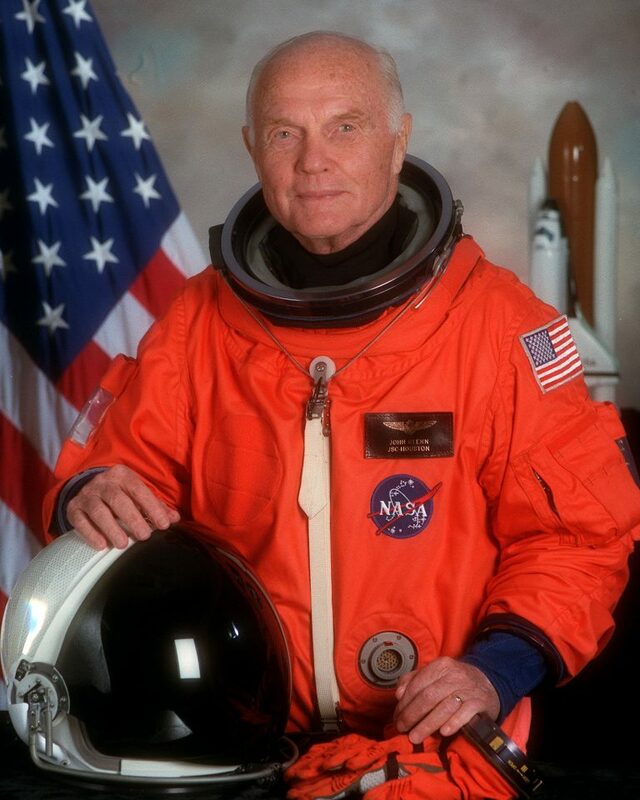 In 1998, he was granted his wish, and at 77 years old, became the oldest person to travel into space. In 2012, Glenn was awarded the presidential Medal of Freedom. Glenn passed away on December 8, 2016 at the age of 95 at the OSU Wexner Medical Center in Columbus, Ohio. He will be interned at Arlington National Cemetery, and is survived by his wife of 65 years, Anne Glenn, their children, and grandchildren.